Black youths in the inner city sound off about police patrols. Part IV of a continuing series. On a sunny weekend afternoon, a group of young African American men are sitting on a park bench at 26th and Medford on the city’s North Side. They’re talking about their experiences with the Milwaukee police. A young man we’ll call “KJ” recalls his most recent encounter, the night before, around 8:00 p.m. Pretty soon the police turned on their flashing lights and stopped the vehicle. According to KJ, the police had everyone exit the vehicle. Then they patted them down, all four of them, including a ten-year old boy. KJ said one of the officers thought he recognized him. “The officer said, ‘I know you. I think I’ve arrested you before,’” KJ recalled. This is what Chief Edward Flynn’s proactive policing strategy looks like for some of the folks who are on the receiving end. Since he took over the Milwaukee Police Department in 2008, Flynn has targeted high-crime areas for extra police attention, ramping up patrols and dramatically increasing the number of citizen encounters with police. Last year, according to police statistics, officers conducted 197,893 traffic stops and 71,839 field interviews in Milwaukee. Many big cities in America have adopted this approach to crime. The idea is to put police in contact with people who may be involved in criminal activity or have knowledge of a crime. Most of the encounters wind up going nowhere, like the traffic stop that KJ so vividly remembers. But sometimes police find contraband or run into someone who’s got an arrest warrant or turn up evidence of a crime. Chief Flynn has acknowledged that, to carry out this strategy, police will stop and question a lot of innocent people. But he says that’s a price that must be paid if folks in high-crime areas want a safer, more orderly community. And he cites police crime statistics as evidence that the strategy is working. “A 21 percent decrease in crime in Milwaukee over the past five years shows that our policing strategies are having an impact,” Flynn stated in a published report of 2012 crime statistics. The question is whether the negative impact of proactive policing outweighs the benefits. 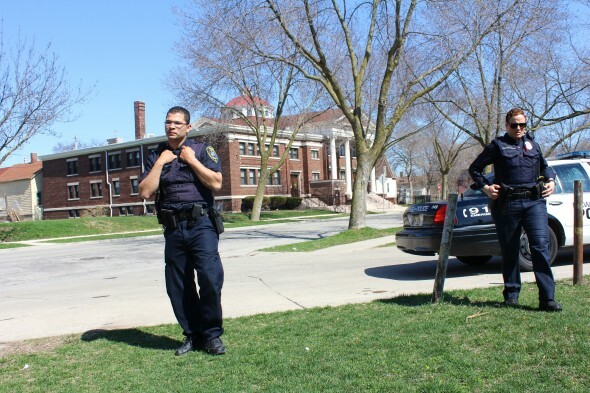 “It’s fair to say that a constant police presence in high crime areas puts youths on edge,” says Jeremy Triblett, program coordinator at Urban Underground, a non-profit youth leadership development organization located at 4850 W. Fond du Lac Avenue. Police on a jump-out at 26th and Medford in Milwaukee. Photo by Mark Doremus. “TJ,” another young man in the park at 26th and Medford, put it this way. “We can’t be chilling without the police harassing us. They can just pull up and jump out on us anywhere. They don’t need any reason. In other words, in TJ’s view, the goal is to intimidate as much as investigate. Police might call it deterrence: be visible, be active on the street and you discourage bad behavior. And, to be sure, there’s bad behavior on the streets of Milwaukee’s poor black neighborhoods. Groups of young people, roaming the neighborhood or loitering on the corner, can be intimidating and disruptive even if they aren’t engaged in serious criminal activity. “When the weather is good, if you come through the black community you will see hordes of young men with nothing to do, nowhere to go, walking the streets almost aimlessly,” observes Rev. Willie Brisco, president of Milwaukee Inner-city Congregations Allied for Hope (MICAH). “It’s really difficult for young people to find a release. Your parks close early, the lakefront shuts down. There are no organized activities that are geared toward youth,” Brisco said.“ So in the summer when you have temperatures in the nineties, those are just powder-keg moments and people are stressed out and you have them feeling like they’re trapped in a limited area. Aerion King, 17, is a member of Urban Underground. By his account, he’s had his share of negative encounters with police. “When I was little I looked up to them. They was going to stop everybody from getting robbed. But then when I got older they started acting like you can’t tell them nothing. “They ride past and they want us to run so they can chase us. Or they’ll come at you like, disrespectful and some of my guys ain’t gonna’ take that, I don’t care if you’re police or not. They’ll come at you like a punk. Quintin Smith, 17, is also a member of Urban Underground. He says he had a run-in with police last fall. “We was just standing on the corner talking. It was me and two of my friends, there were three of us. It was seven or eight o’clock and they stopped us and it was like, ‘You have to move around. You can’t just stand here.’ And so we said, ‘Okay, whatever,’ and we was walking on and they was following us. To make sure we were leaving. Before she was appointed to the Fire and Police Commission, nominee Ann Wilson was quoted saying the relationship between the African-American community and the Milwaukee Police Department is “tenuous to say the least.” She declined to elaborate but if you talk to African American youth in Milwaukee, you begin to see what she means. Last spring I was returning from a fishing trip with a friend who drove. We were stopped Sauk County for speeding, on Hwy 60. We were driving with the flow of traffic. The officer asked for my friend’s driver’s license, vehicle registration certificate and prof of insurance. After examining these he demanded to see my driver license as well. (I wasn’t driving.) The police state reaches far beyond the bound of Milwaukee’s neighborhoods. I think that this statement is just creating excuses. The parks and lakefront do not close “early” they close at 10 o’clock! Youth under 21 should be at home getting ready for the next day or at friends homes. When I was younger, we played bball at Sherman Park, then played videos games or watched TV after 10. Its not like there are some magical programs that are available late night for teens in the suburbs. It also is ridiculous to say that there are no organized activities for youth. In Milwaukee, you can’t sneeze without finding a youth program for kids to attend. You have MPS rec, boys and girls clubs, CLC’s, running rebels, ect. There is always something to do or somewhere to go for our black youth. Basketball in the parks, volunteering, or just at a friends house playing cards/dominoes/xbox. There is no excuse for youth to just “roam the streets”.